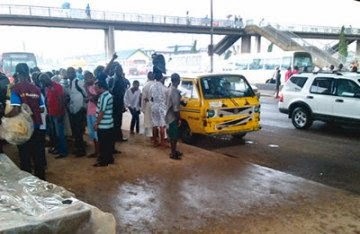 A four-man gang said to be kidnappers stormed Oshodi under bridge on Saturday, snatching a young woman at gunpoint. One of them was reported to have worn the uniform usually used by officials of the anti-robbery squad. Punch reports that the victim was walking along with her mother when she was confronted by the men. It was said that the mother was threatened with a gun when she wanted to defend her daughter. The gang, who were said to have arrived at the Oshodi area around 2.30pm, whisked the womanaway in a Honda Pilot jeep. PUNCH Metro also learnt that the young woman struggled to avoid being abducted by snatching handcuffs from one of the abductors and smashing it on his head. The man, who was reported to be on a uniform with a scorpion logo at the back, corked his gun to disperse a crowd who wanted to help the woman. When their correspondent arrived at the scene of the incident at about 2.45pm, the victim’s mother was seen pacing up and down and shouting “egba mi, omo mi!” (Please help me, my daughter). The worried mother did not reply our correspondent’s enquiries as she ran after the vehicle. One of the eyewitnesses, who craved anonymity, showed PUNCH Metro the picture he took while the car was zooming off, adding that the angry crowd hurled stones at it. Another eyewitness, who gave his name only as Johnson, said the gang might be cultists, adding that the woman might have stepped on their toes. A man simply, identified as Ayo, however, said that the men were kidnappers. He said they would have killed the woman on the spot if they were cultists. “I cannot say they are policemen because the man in uniform has beard which is not allowed in armed forces. They must be kidnappers. They would have shot her dead if they were cult members,” he said. Attempts to get a reaction from the Lagos State spokesperson, Ngozi Braide, proved abortive as calls made to her mobile phone rang out. She had also not replied to the text message sent to her phone as of the time of going to press.